Last September I bought myself a handgun as a birthday present since this was a tradition I started when I turned 21. Now, don’t get me wrong—while this is a tradition I have not been able to adhere to it every year. I think I started this tradition due to the fact that no family member or friend would likely buy me a handgun so I took it upon myself to do so the very day I was old enough. Last year I purchased a Colt Model 1908 Pocket Hammerless pistol in pretty much junk condition. I already have three examples of Colt’s Pocket Hammerless; one in each caliber Colt offered (.25 ACP, .32 ACP, and .380 ACP). I love this design and the history associated with this pistol, but I do not shoot them often due to their collector status. My birthday present was certainly not in collect condition so there was no need to keep it in its original state. I have long wanted to correct one of the glaring defects common to pistols of this era which is their almost nonexistent sights. Now there could be several reasons for this phenomenon. First of all long range handgun shooting did not gain much popularity until after WWII; so at the turn of the century (the last one, not the current one) handgun shooting was seen as a close range defensive art. 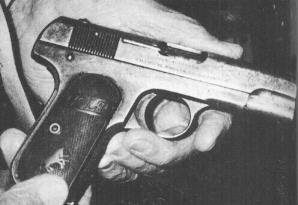 Secondly, small semi-automatic pistols were seen as pocket guns. Men’s trouser and coat pockets were larger and suits were baggier so these thin, flat pistols were a natural to be slipped into a pants pocket, suit jacket pocket, overcoat pocket, or, in the case of the Model 1908 in .25ACP, a vest pocket. Thus, large sights would snag on the pocket and become a liability. The condition of this junker would allow me make any modifications I desired to pay for. The Colt Pocket Hammerless is another design by firearms genius John Moses Browning (one of these days I must pick up a biography on him). The story goes that he presented the design for this pistol to Colt Management in 1899 and they weren’t that interested as they were busy trying to produce a new larger caliber pistol which would win them another military contract. Short sighted American firearms manufacturers made the mistake of turning down Browning designs on several occasions. When they did, Fabrique Nationale d’Armes de Guerre of Belgium was always ready to welcome Browning. While Colt toiled away on a military sidearm Fabrique Nationale produced Browning’s self loading pocket pistol as the FN Model 100. In a relatively short period of time Colt found that their civilian sales in Europe were drying up as the market was in love with the FN-Browning pocket gun. Colt also realized that American retailers were beginning to import this pistol in fairly large quantities. Colt quickly brokered a deal with Browning and Fabrique Nationale to be able to produce the handgun for U.S. sales. On June 19, 1903 Colt began shipping out their new Model 1903 Pocket Hammerless in .32 ACP. Five years later they also released the Model 1908 in .380 ACP and a smaller (vest pocket) version in .25 ACP. 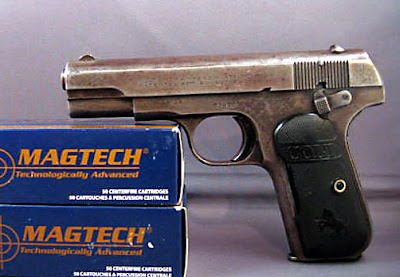 The Pocket Hammerless was vastly popular and by the time production ceased after WWII Colt had manufactured over one million of these pistols. Unfortunately, quality became the demise of the Pocket Hammerless. By the end of WWII, Colt’s machinery was worn out and the staff made these pistols was retiring. The Pocket Hammerless was a “tight” pistol which required a fair amount of hand fitting. The reinvestment in the equipment and personnel required to make the model 1903 and 1908 would raise the cost of making the handgun beyond the reach of their customer base so it was discontinued. The Pocket Hammerless has had a storied past in terms of who utilized the pistol. Many were privately purchased during WWI and slipped into the trench coats of the American Expeditionary Forces. By WWII they were standard issue to General Officers in all branches of the military and used in moderate numbers by the Office of Strategic Services, the fore runner to the CIA. Their issuance to General Officers continued through the Vietnam Conflict. The Pocket Hammerless was also popular with the gangster contingent as well. Al Capone was said to have kept one in his night stand. 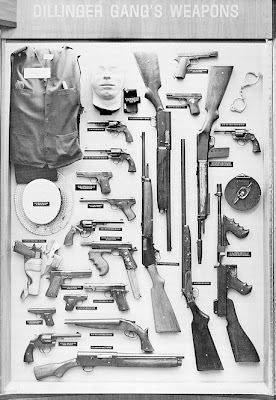 John Dillinger owned several of them. And while Clyde Barrow favored Colt’s Model 1911A1 in .45 ACP, he used a Pocket Hammerless in .32 to break out of jail after Bonnie Parker smuggled it to Clyde by taping it to her thigh. The Pocket Hammerless also has figured prominently in the popular media. Raymond Chandler’s famed Private Detective, Phillip Marlowe, favored the Model 1903 in .32 ACP. 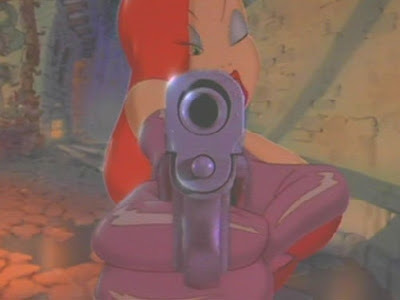 Humphrey Bogart brandished one at Claude Rains in Casablanca and, in Who Framed Roger Rabbit, both Cartoon Mogul R.K. Maroon sported one (gold plated and engraved) and Jessica Rabbit took a shot at Judge Doom with one (although on closer inspection the barrel to slide fit is not good and it appears that she had the sights filed off—probably the reason she missed). Upon buying the “project” Model 1908 it was apparent that it needed more than new sights. The finish was completely worn off and the gun sported a sickly brown patina with spots of pitting in several areas. The grips were cracked and chipped. The Safety spun like a top and the recoil spring was more crooked than a Democratic presidential front-runner. I had a tinge of buyer’s remorse as I wondered if this gun could be restored and improved upon. Luckily, Mike Dudley, the gunsmith at Impact Guns in Boise (who has trouble-shot many of my pistols) told me that the project would be “no problem at all”. The pistol had to be reblued and although I do not know who Mike sent it to, whoever it was did an outstanding job. Refinishing old guns like this can be a tricky prospect. I have dealt with many a gunsmith who would not reblue but merely Parkerize a gun with this much pitting on it. The first step in the process is to polish the metalwork prior to the bluing process. I have seen many an old handgun get over-polished which seriously detracts from the firearm’s value. This gun looks like it just left the factory in 1921 (the date of manufacture according to the serial number). All of the imprinting on the pistol is intact and crisp. After the gun was reblued, Mike went to work replacing the springs, replacing and repairing the safety and putting on the new sights. Mike had to first mill off the original sights and then cut, file, and fit the new ones. Mike was able to find a small and fairly low profile set of sight. I did not discuss a preference on the accoutrements of the sights but Mike must be somewhat psychic. He put a large white dot on the front sight so my 50 year old eyes could see it better and put a solid vertical bar on the rear. I very much prefer this set-up to the more popular 3-dot system. I find that the bar and dot system makes the sights much easier and faster to acquire and keep on target. When raising the pistol I just “dot the i” and I am ready to shoot; no lining up three dots and then having to re-level them after absorbing recoil or other movement. The last step was to replace the cracked and chipped grips. This turned out to be the one of the most difficult prospects of the entire process. Mike had a set of original Jay Scott Mother of Pearl grips which looked fantastic against the deep blue of the pistol. But, when Mike test fired the pistol they cracked and broke off. No worry, I had a set of Ajax Ivory Polymer grips sitting idly by in my grip drawer so I put them on. During my first outing with the pistol they also cracked and broke off. This was somewhat alarming since I figured the Ivory Polymer to be nearly indestructible. Finally I ordered a set of Eagle’s American Elk stag grips which is a very handsome addition to the final product. All in all Mike Dudley did an outstanding job on this handgun and at a very reasonable price. I would do this again in a heartbeat. And, as you can see below, she’s a shooter. The target below absorbed 22 rounds of Mag-Tech .380 FMJ ammunition at a distance of 21 feet.